The footwear produced by us has a number of unique features that distinguish it from the many types and types of footwear available on the market. The Gucio shoe upper is made entirely (also lining) of 100% natural velor leather (coming from Polish tanneries). So far no better material for footwear for children has been invented. Hygroscopic and rheological properties of the natural skin as well as the absorption of sweat and "breathing" of the feet (children's feet do not sweat and do not give off an unpleasant smell) are unmatched. The bottom of our products is made of a yellow material called - styrogum, very light and soft, great absorbing shocks. Under a completely leather lining, install a 3mm insert (specially chamfered) from natural real latex as a heel support bed that gently reaches the midfoot. 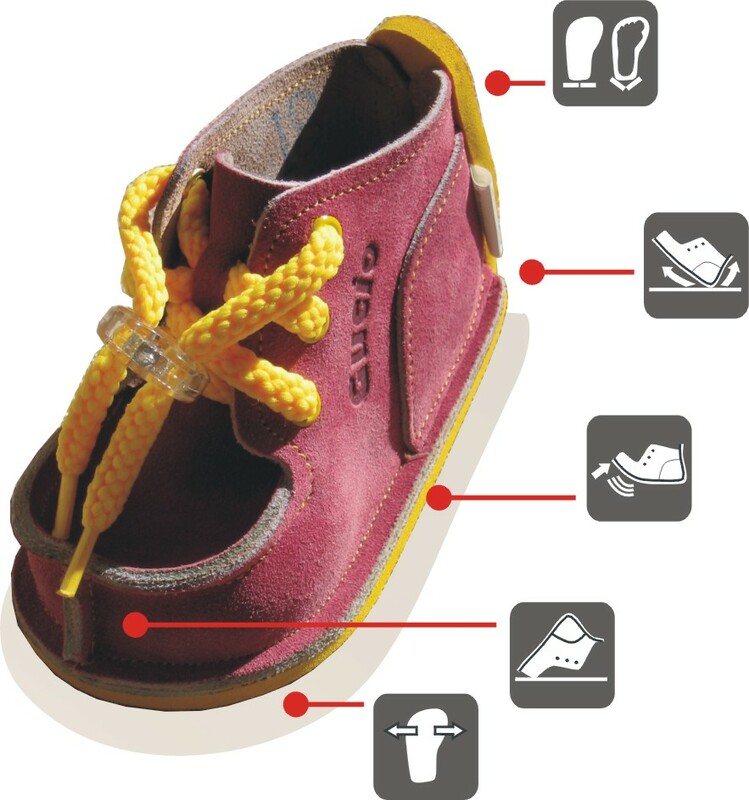 A flexible sole made of a soft and very light material - a styrogum that provides the child with walking comfort, and additionally, the innovative Ergono Ergon System uses an advanced Bending Axis System to facilitate the correct positioning of the first steps and correcting the positioning of the feet (forefoot) inwards. Thanks to the curved sole that comes out on the back of the shoe, high on the floor, the child sitting very easily gets back and gets up, and what's important is not to lose shoes. All our versions have a seam stitched outside on the fingers, it acts as a bumper and protects the child's fingers during play or so-called. "Crawling". It is this seam and not the fingers that rubs during everyday play. One-of-a-kind heel with vertical stitching, which after inserting the foot will adjust to the individual heel width of the child and after curling around the heel itself will stiffen, our heel provides excellent hold of the calcaneus and causes that the heel of the small child does not have any looseness that can cause abrasions while walking or playing. The vertical seam additionally correctly guides the vertebrae (held vertically) to the ankle joint, preventing accidental dislocation of the joint (step).